La-La Land Records and Lionsgate present the remastered and expanded re-issue of acclaimed composer Marco Beltrami’s (SCREAM, HELLBOY, THE HURT LOCKER, THE WOLVERINE) Oscar-nominated original motion picture score to the acclaimed 2007 feature film 3:10 TO YUMA, starring Russell Crowe, Christian Bale and Peter Fonda, and directed by James Mangold. 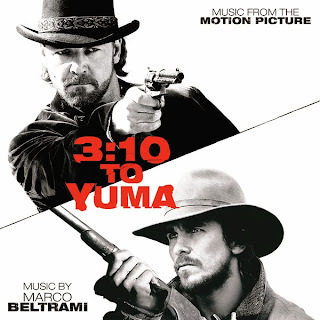 Beltrami honors this thoughtful and thrilling re-imagining of the original 1957 YUMA with a rich orchestral score that brilliantly mixes period instrumental approaches with a modern orchestral group and recording techniques. The result is both a tribute to traditional western movie scores and an inventive soundscape that reflects the brutal existence of the movie’s characters. Produced by Marco Beltrami, Buck Sanders and Dan Goldwasser, and mastered by Erick Labson, this special limited release of 3000 Units sounds better than ever and is expanded with a selection of exciting bonus tracks. Quick-draw art design by Dan Goldwasser features exclusive, in-depth liner notes by writer Jeff Bond, with new interview comments from the composer. Well there you go, can you dig it... yes you can!